This shabad has a very very important line in it. Apanae baalak, those who have become apanae baalak, who have become the sons and daughters of God, those who have recognised Waheguru Jee as their father, mother, their everything, aap rakhian - Waheguru Jee Himself, aap - Himself, rakhian, looks after them. Paarabreham - That Waheguru Jee Who is beyond all limits, Who is the highest creator being, guradhaev - and Who is gur, Who is forever consciousness and dhaev - light. The One Who brings light and consciousness into our lives, Who takes us from the darkness into the light, Who makes us divine beings, That Guru himself looks after those who look to Him as their mother and father. If you look to Waheguru Jee as your support, then Waheguru Jee Himself will guide you. There's a small story related to this - It is said one day, a king asked a holy man this question. O holy man, you always say that God Himself looks after his servants, why doesn't God just send an angel, or a demi-god? Who doesn't God send someone else to look after his servants, his devotees? The saint said, I will answer this question to you one day. That wise saint then made a doll, a statue that looked exactly like the king's son, the prince. He stood the statue of the prince just by a lake that was outside the king's palace. When the king was walking around, he saw what he thought was his son. He called out to him and said, O son, come over here, you're close to the water. Obviously we know it was a statue, but he thought it was his son. When his son didn't listen, the king walked towards him. What happened was that there was a little rope that was tied to the foot of the statue. The wise man was hiding in the bushes, he pulled that rope, and the statue fell into the water. Even though the king had his bodyguards all around him, he had those people who were paid, who were hired, whose job it was to protect his life, even thought they were all around him, even though all his ministers were there, he didn't tell anyone else to jump into the water, he himself ran in, he didn't think of anything else, he jumped straight into the lake. When he came out, he had the statue in his arms, he was furious. Then he saw the wise man, the saint, the sage. He asked him, what was this? What was the point of this? The sage looked back at him and answered, this is the answer to your question. The king asked how is this the answer to my question? The sage said you asked why God didn't send anyone else, the sage asked why did you jump into the water, why didn't you send your bodyguards, or your ministers? He replies, because the child was mine, he was a part of me. The sage laughed and said the saint of God are not apart, they are His children. Just as you love your child so much, so they belong to Him, and He looks after them. Aap rakhian, that is the great philosophy in the first line of this shabad. What happens to those saints? They get sukh, eternal peace, saa(n)th, their mind becomes completely peaceful. Sehaj - they live their life in this balance, in this state of being where they cannot be affected by happiness or sorrow, aanadh - they have the highest pleasure of life, bheae - and they get all of this, pooran bhee saev - when their seva, their service to The Lord becomes pooran, becomes fulfilled. What does this mean? That their seva ends? No. The seva becoming pooran means it becomes perfect. Practice makes perfect, practice will perfect you. Practicing The Guru's mat, The Guru's wisdom will give you that perfection. Rehaao - Guru Jee says pause and think about this. Sitting down everyday and saying Waheguru Waheguru. why do we do it everyday? So that we can get That one Waheguru come out of our mouth with which our heart, mind and soul will be attached to The Lord. The seva doesn't finish, it becomes perfected. They learn the art of service. When you've learnt how to serve, then you will get peace, you will you will get sehaj, you will get aanadh, you will get this pleasure. because they have known Waheguru, because those bhagath jan, those devotees, those lovers of God have known The Lord to be their own, sunee prabh aap - Waheguru Jee Himself listens. Waheguru Jee sunee - listens Himself, aap. Why is aap there? Because they have understood God to be their own. That is why God listens to their baenathee, to their supplications, to their prayers. For at earliest dawn we go - no talk of me and thee! It is but as the meeting of travellers on their way! Then every bough is silent; we're flown as morning breaks!" dhokh hamaarae bakhasian - Waheguru Jee has bakhasian, has forgiven the dhokh, the sins. Apanee kal dhhaaree - because He has blessed me with His kal, with His power. It is not through my power that I can get my sins forgiven. It is His power, it is Waheguru Jee's power, it is gurparsad, The Guru's Grace. at that point you get the fal, the fruits of your man baa(n)shhath, of your mind's desires. Dhithian - Waheguru Jee gives them to you. 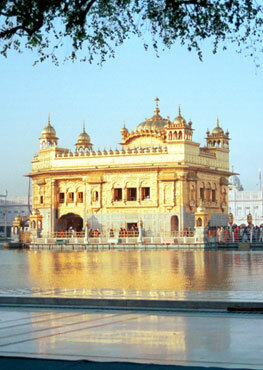 Naanak balihaaree - Sri Guru Arjun Sahib Jee says that I am balihaaree, I offer my mind, body and soul. Balihaaree means to surrender my mind, body and soul to That Waheguru, That Lord, That God Who has forgiven our sins, and Who has saved us.